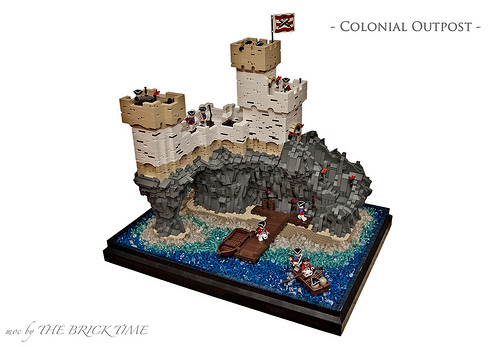 Soldiering in a place like the Colonial Outpost by The Brick Time Team must be a little desired job–although it affords views like no other. This really is an excellent piece of work, though. The weathering of the sandstone walls is superbly done, and probably does more to make this MOC stand out than anything else. The rest of the diorama is terrific too, however, with the good effect made of the transparent 1×1 round plates for water, and some nicely detailed rock work. LOVE the pitted walls and craggy cliffs! Nice one!